Japanese corporate governance and managerial practice is at a critical juncture. At the start of the decade pressures mounted for Japan to move to a shareholder-value driven, 'Anglo-American' system of corporate governance. Subsequent changes, however, may be seen as an adjustment and renewal of the post-war model of the Japanese firm. In adapting to global corporate governance standards, Japanese managers have also been reshaping them according to their own agenda of reform and restructuring of decision-making processes. The board's role is seen in terms of strategic planning rather than monitoring, and external directors are viewed as advisers, not as representatives of the shareholders. Managers have adopted a variety of defences against hostile takeovers, including poison pills in some cases. Although shareholder influence is more extensive than it was, central aspects of the Japanese 'community firm' remain in place. The commitment to stable or 'lifetime' employment for a core of employees, although coming under severe pressure, is still an important point of reference for Japanese management. 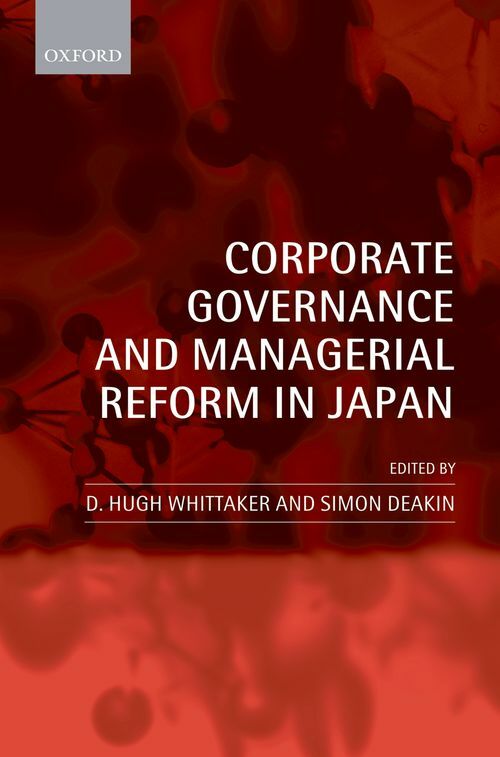 Corporate Governance and Managerial Reform in Japan is based on detailed and intensive field work in large Japanese companies and interviews with investors, civil servants, and policy makers in the period following the adoption of significant corporate law reforms in the early 2000s up to the months just before the global financial crisis of 2008. The Japanese experience suggests that there are limits to the global convergence of company law systems, and that the widespread association of Anglo-American practices with the 'modernization' of corporate governance has been misplaced. This conclusion is unlikely to be altered - it may be reinforced - by reactions to the financial crisis. 6. Managers and Corporate Governance Reform in Japan: Restoring Self-Confidence or Shareholder Revolution? D. Hugh Whittaker is a Professor at the University of Auckland Business School. He has written extensively on Japanese and comparative management, entrepreneurship and innovation, most recently Comparative Entrepreneurship: The UK, Japan, and the Shadow of Silicon Valley (with P. Byosiere, S. Momose, T. Morishita, T. Quince and J. Higuchi) and Recovering From Success: Innovation and Technology Management in Japan (co-edited with R. E. Cole), both from Oxford University Press. ; Simon Deakin is a Professor of Law at the University of Cambridge and director of the corporate governance research programme of the Centre for Business Research, also at Cambridge. He has recently been a visiting professor at Columbia University and at Doshisha University, Kyoto. He published extensively in the fields of corporate governance, labour law and tort law. He was elected to a Fellowship of the British Academy in 2005.